The Thomas Edison recordings took place on June 6th and 7th 2008, at the newly renovated Thomas Edison Historic Site in West Orange, New Jersey. Pianist and collaborator, John Conte and I arrived around 10 am on the 6th to meet Gerald Fabris, Music Curator and Engineer for the museum. Immediately, we were both struck by how incredible these two days were really going to be. In the middle of the room, right next to the beautifully polished brass horn and wax cylinder recording machine, was a very large picture of Thomas Edison; the man himself, in the midst of a session just like the one we were about to undertake. Most of the first day was spent testing the piano/voice placement. It turned out that the best way to record was to have me sitting with my mouth as close to the horn as humanly possible and the piano pressed into my back, so that it could be close to the horn as well. I actually had to crawl into my chair to sit! On the second day, we recorded the bulk of the material (19 arias and/or songs) in one sitting. What you hear is what we did. Remember, in this medium, there is no going back and fixing it! At around 11:30, audience members began filing in and were able to come and go at their leisure. As an operatic tenor who had studied the great singers of old, I was excited to see what my voice was going to sound like when recorded with the same machines they had used. It was not so much for my own gratification, but as a scholarly experiment. Anyone who has studied old recordings of tenors such as Caruso, (although he didn't record on wax) Alessandro Bonci, Giuseppe Anselmi and Jose Mojica, have always wished to hear what they had sounded like in person, or to be able to figure out what qualities the voice loses when recorded in this manner. Do the recordings help or hinder the sound? Was Caruso's' voice really that rich and large? In my own way, I was going to be able to get a little closer to the answers by recording on wax and comparing those recordings to the "modern" recordings of my voice, thus coming to some sort of conclusion as to the probable "live" qualities in the famous tenor voices of the past. *At first I noticed that the wax recording machine was much more accurate than I had originally thought. I expected a much more "primitive" sound. It did not seem to be able to catch the upper overtones, the squillo, or "ring" of the voice, and made my sound thinner than it normally is. 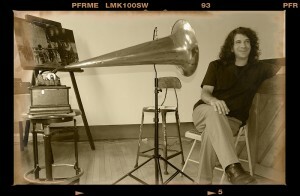 I felt like I lost quite a bit of tonal color, which, of course, means that the voices we hear recorded on wax cylinder were actually much richer live than they sound to us today. *Since the machine does not always rotate at the exact same speed on each rotation, the pitch would sometimes sag due to the slowing of the wheel. This drove us a little batty at times, and was something we had to learn to live with. *You really had to "move around" when singing. As you went higher and/or louder, you had to lean back so as not to overload the system. On soft passages you had to actually stick your head in the horn! *All of the lovely nuance that John Conte brings to the keys had to kind of go out the window. He found that he had to just play as loudly as possible to be able to be heard on the recordings. The horn is very directional and you must be right in front of it for it to capture any sound. *The strangest phenomenon was the instant echo. When you sang a note into the horn, a millisecond later you would hear that note coming back to you as it was being etched into the wax. It was so strange to hear your voice in the present "sound" and then almost immediately hear it coming back at you as if from the "past.